HYDERABAD: Veteran folk singer and musician Vinjamuri Seetha Devi passed away in the United States on Tuesday. Born in Kakinada, Vinjamuri Seetha Devi grew as one of the most respected folk musicians. Besides being a musician and singer she was a scholar of Telugu folk music and authored ‘Folk Music of Andhra Pradesh’. 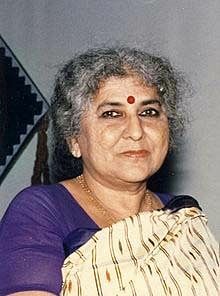 She was a producer of folk music for All India Radio and composed music for the popular and critically-acclaimed film ‘Maa Bhoomi’. Along with her sister, Anasuya Devi, she composed music for many famous Telugu poets like Srirangam Srinivisa Rao (Sri Sri). Telangana chief minister K Chandrasekhara Rao expressed grief over demise of Vinjamuri Seetha Devi.